We work with many different types of organisations all over the world. Outlined below are some of our more recent projects, in each case the platform was customised to meet the client’s specific needs. PricewaterhouseCoopers is the second largest professional services firm in the world, one of the Big Four auditors. PWC has its own performance improvement and staff cost reduction approach, known as Wellbeing Margin. 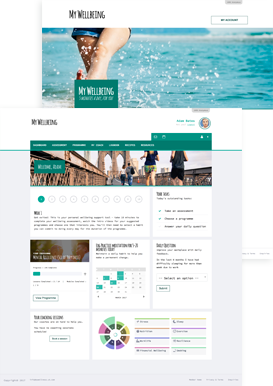 They asked Revitalised to develop the WellbeingZone platform to enable them to integrate their custom services and content into our broader wellbeing offering. The resulting service combines the best use of technology with offline support and analysis. Caring for the team who cares for others. A custom approach. Virgin Care provides front line NHS and social care services across the country and, since 2006, has treated more than 5 million people. Their aim is to deliver healthcare in a more innovative way that focuses not only on the clinical outcome, but also every patient’s experience of care. In order to support their employees in what can be challenging roles requiring physical, mental and emotional resilience, Virgin Care asked us to customize the WellbeingZone to meet their specific needs. 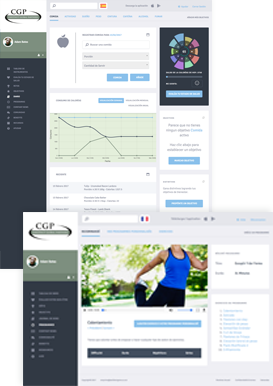 The custom elements of the site have been integrated with existing features and content libraries, allowing users to benefit from the logbook and tracking tools, exercise and recipes libraries and the continually updated multi-media health and fitness content stream. The Ministry of Defence (MOD) is responsible for the implementation of the government’s defence policy and is the headquarters of the British Armed Forces. 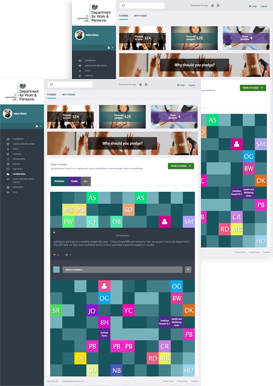 Working in conjunction with a key partner, Revitalised was asked to build a custom platform for the MOD, with the key focus on providing anonymous access to a wide range of mental and physical wellbeing resources, tools and services, with optional supported advice and guidance provided within the platform by a professional. This meant developing two levels of anonymous user access, a basic, unsupported, level providing access to generic resources and a second, premium (yet still free to the user) level, with full access to all features, functionality and custom content, developed specifically for the MOD. 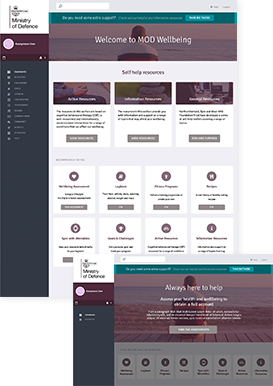 A custom admin and support centre was created to make it possible for supporters to provide optional advice and guidance, based on an individual user’s assessment scores and behaviour within the platform. The Royal Mail is the UK’s designated Universal Postal Service Provider, supporting customers, businesses and communities with a six days a week service to more than 29 million addresses across the UK. The Royal Mail has been working hard to promote wellbeing at work as well as ensuring it supports individuals with mental or physical health problems and provides practical support. The WellbeingZone, rebranded as “FeelingFirstClass”, has been part of this process. With the approval of the two major Unions, CWU and Unite, and input from employees, an online Stress Tool was added to their platform. The Stress Tool is a short online questionnaire completed anonymously. Feedback is provided to users on seven different categories, ranging from control in the way a job is carried out to manager and peer support, with specific advice on how and where to get more help if it is required. In addition to providing support and advice to specific users, the anonymous, collated results are provided to the Royal Mail to enable them to understand health trends across the business and to design programmes or interventions to support employees’ health. There is also a range of articles with specific advice relating to Royal Mail wellbeing services in a specially-created “Toolkit” section within the platform. We work with a large number of NHS Trusts, supporting their employees in their managing their wellbeing, whilst they work hard to care for all of us. 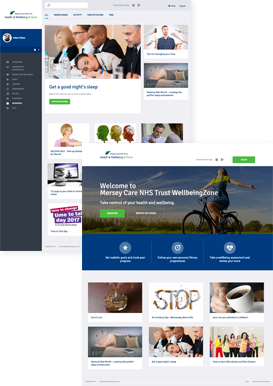 The NHS trusts benefit from the wide range of tools and features that are included in the WellbeingZone, from the wellbeing assessment to the logbook, goals, fitness and relaxation videos and a constantly updated health and wellbeing multimedia content stream. Even better, in some areas access to the platform has been extended to the general public as part of a public health initiative, bringing the full range of tools, features and resources out the to community. YMCAfit is one of the UK’s leading trainers of fitness professionals. 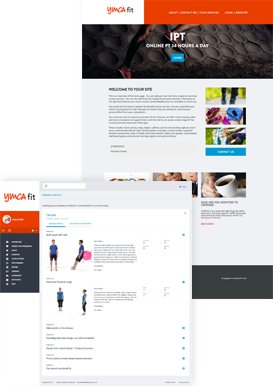 We worked together with YMCAfit to develop a white label product which is offered to all participants of their personal trainer instructor courses, enabling them to start their new PT career with a market-leading website, personalised to highlight their own background and services. 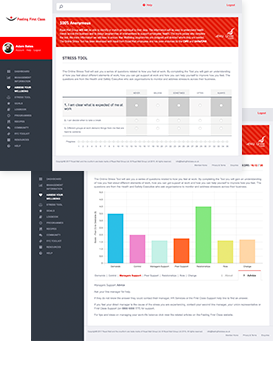 The platform was developed to include a client manager system, where Personal Trainers can create individual training programs for their clients and view feedback and progress via an online training diary. All key data, including PARQ, assessments and goals for each client are held in one place. Full integration of our Consultations module means that PT’s can broaden their service to include online training, or simply offer added-value video or online chat consultations. For PT clients the benefits are numerous. In addition to the wide range of standard WellbeingZone features, they have their own personal training program complete with video demo, description and PT notes for each exercise. Chestnut Global Partners (CGP), based in Bloomington, IL, has been providing Employee Assistance Programs (EAP) and related workplace services since 1984. They have an extensive network of providers covering all 50 states and an international network covering over 140 countries. It was Chestnut’s international outlook that prompted us to complete a project we’d had in mind for some time – making the platform multi-lingual. A bigger job than you might think, as with dealing with the topic of wellbeing, there are cultural references throughout the platform – not only in the content stream, but also the wellbeing assessment questions, food database, and of course date format! The work was completed and the WellbeingZone now exists in French, German, Spanish, USA and Australian English as well as UK English. Whilst each organisation has a default language (and time zone), individual users can select the language of their choice. CABA supports ICAEW (Institute of Chartered Accountants in England and Wales) members, their partners, ex-partners, and dependent adults and children with their wellbeing, be it emotional, physical, community, financial or career-related. CABA are a great example of how regular promotion and strong communication materials can positively impact registration and ongoing engagement with the WellbeingZone. They have a very active, engaged user base that login regularly to use the tools and resources and get the latest updates. 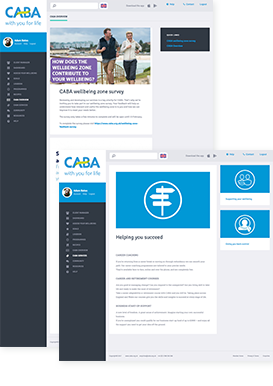 In addition to their custom pages, which bring together an overview and links to offline and other supporting services, CABA regularly use the “company news” feature, allowing them to publish news and updates to members and send out an email prompting members to login to read the full article. Police Mutual provides services exclusively for serving or retired Police Officers, Staff and their families. The foundation believes that remaining fit and healthy is essential for their members and so invested in the WellbeingZone as part of an overall £2.4m investment program to improve the wellbeing of Police and Military in 2016. The WellbeingZone was rebranded for each of the police forces that signed-up and was made available to all employees regardless of grade or location. 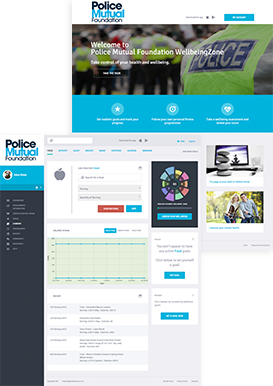 The multi-media wellbeing content stream is customised for Police Mutual, with more focus on topics relevant to the police, from tips on improving your bleep test score to how to be there for colleagues who may be experiencing mental health issues. On their website, Police Mutual state that in 2016 70% of active Wellbeing Zone members increased their exercise levels and 70% of smokers reduced the amount they smoke, so we’re pleased to be making a positive contribution to the health of the UK Police Service. The Department for Work & Pensions (DWP) is responsible for welfare, pensions and child maintenance policy. As the UK’s biggest public service department it administers the State Pension and a range of working age, disability and ill health benefits to over 22 million claimants and customers. 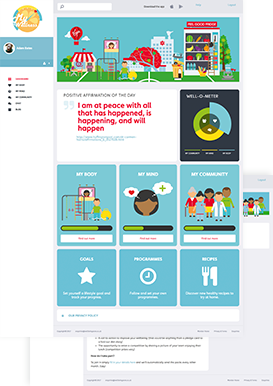 In order to encourage a commitment to positive lifestyles changes and sense of community within the department, we were asked to develop a new feature for the WellbeingZone. We created a Pledge Wall where users could publish “public” (showing name and avatar), anonymous or team pledges, all of which was housed within the WellbeingZone. Feedback has been very positive and we “pledge” to do more projects like this one! If you’d like to find out more about what we do, and how we could help you support your team’s health and wellbeing, please get in touch. We’d love to arrange a product demo via webinar or arrange a meeting to discuss your requirements in person. © 2017 Revitalised Ltd. All rights reserved. A humble brag, but we are really good at what we do. As the creators of the marketing leading health and wellbeing application our team prides itself on innovating the market. Our in-house team takes our product and makes it yours. We can help you too. Not only do we create our own products we can help deliver and make a success of your products too. Our digital specialists can design, architect and provide strategic direction for your product and service. 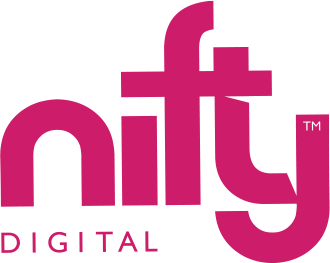 We are constantly growing, if you want to join a team of talented, like-minded digital specialists and build a product which is making a real change then please send us your CV. We employee people that have ideas and want to grow our business. We want game changes, not clogs doing the same old thing. A happy business has happy employees. Regular social events and a company bonus will put a smile on your face and extra money in your pocket.